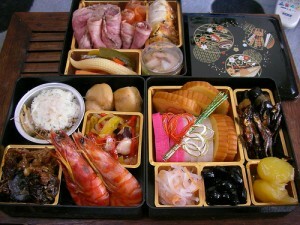 In Japan, we eat traditional Japanese New Year foods called osechi, during the first three days of the new year. The foods are beautifully dished in special bento boxes called juubako. The tradition started in the Heian Period (794-1185). In the old times, they didn’t use a hearth and cook meals during New Year’s days to not bother gods. Osechi was made by the end of the previous year, and the foods are preservable for few days, so women did not have to cook in the New Year. Each dish in osechi has special meaning; for example, sea bream is “auspicious”, shrimp is “long life”, kombu sea weed is “joy”, herring roe is “gifted with numerous children”, kuri-kinton (mashed sweet potato with sweet chestnuts) is “prosperity”, rolled omelet with fish paste is “wish for many auspicious days”, and black soybeans is “health”. If you want to try osechi food, I recommend sweet and delicious kuri-kinton. Soak the sweet potato cubes in water for a couple hours. Rinse the potato cubes well. 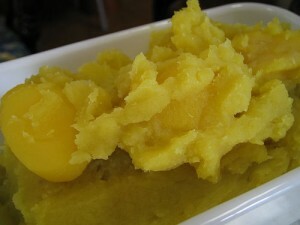 Put sweet potato cubes into boiling water and cook until softened. Drain the water and put the sweet potato cubes back in the pan. Mash the potatoes and add sugar and mirin. Put the pan on low heat and stir well.